In these long breaks between the signature 21 Essays series, I relax by considering possibilities for future series. I spin the roulette wheel to pick a year (or set of years) and then brainstorm on some potential essay topics. This time the wheel spins, gradually slows, then clicks to a stop, pointing at: 1965. So here’s my fourth 1965 series possibility: 21 essays on Help!, Richard Lester’s second movie with the Beatles. and Ringo in the distance in Help! (1965). I’ve been resistant to proposing this particular series. In many ways, I think Help! represents a brief slump for the Beatles as they looked for new direction—a bold direction which would blossom with the release of their album Rubber Soul in December 1965. There’s so much great music from 1965 by other singers and groups… why go with an inferior Hard Day’s Night retread? My reasons for embracing Help! are entirely personal, but that’s in keeping with the nature of these 21 Essays series. I want these essays to be personal. I was five when Help! was released. Although I have no idea where or when I saw it, I know that it’s one of my first movie memories. Then as a teenager, I revisited it at a midnight revival (very, very good memories!). Finally, as an adult, I experienced a radical Proustian moment revisiting it. 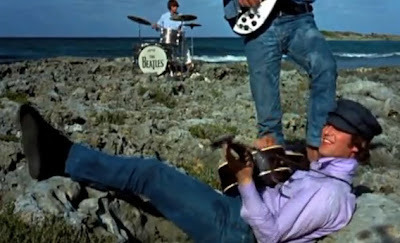 Watching the Beatles cavort on some faraway beach, I suddenly realized how unbelievably young and happy they were (particularly one shot of John Lennon) at that moment of time. Memories triggered of youth and a sense of time passed—the Beatles as my madeleine. It’s one of the purposes of 21 Essays to make note of special moments like that. For all its flaws, Help! has been the right movie at the right time for me on several occasions. And, seriously, a slump that still produces songs like “Help!” “You’re Going to Lose that Girl,” “You’ve Got to Hide Your Love Away,” “The Night Before,” and “Ticket to Ride” has to be considered pretty impressive! Tomorrow, I’ll propose the last of these 1965 ideas (with no promises that I’ll necessarily be getting to any of them…). But I’m wide open to other suggestions. Any ideas for 1965 movies, books, short stories, poems, songs, paintings, or other cultural artifacts that might inspire a good 21 Essays series?